Doncaster Knights climbed above Bedford into ninth place in the Championship table following their 25-19 win over the Blues at Castle Park. The result kept their outside hopes of pipping Jersey for eighth spot alive, though for that to happen they need to beat relegated Plymouth at Brickfields in their last match and for the Islanders to lose at home to second-bottom Moseley. 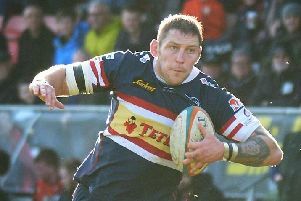 Had Knights’ home record been better on their return to the second top flight of English rugby – the win over Bedford was only their third league win at Castle Park – then their spot in the top eight would already have been secured. Knights raced out of the blocks and treated the Castle Park fans to some inventive rugby in the opening minutes. Had Matt Clark, who formed a useful centre partnership with the recalled Bevon Armitage, managed to hang on to a long pass by fly-half Ume Fosita, on the Bedford 22, there could have been early joy for Clive Griffiths’ men. But they struggled to recapture their earlier momentum when play resumed after a delay of around 15 minutes while prop James Currie was treated for what at the time appeared a serious injury. He was the second forward Bedford lost in the opening minutes – flanker Justin Blanchet suffering an ankle injury in the opening two minutes. Knights took a deserved lead on 11 minutes after flanker Latu Makaafi peeled off from a driving maul and managed to get the ball down from close range. Wing Dougie Flockhart added the extras and also converted a 35th minute penalty to make it 10-0. Knights should have had at least one more try at that stage - Bedford full-back Steffan Jones doing well to prevent Armitage finding his support following a midfield break and making him go himself. Little had been seen of Bedford in attack until lively wing Dean Adamson kicked ahead to score a converted try just before the break. Armitage made the initial break which led to wing Tyson Lewis, always a handful with ball in hand, racing in for a 43rd minute try. Despite being a man down at the time, Bedford closed to within a point and the game was too close to call at the start of the last quarter. A Flockhart penalty and a close-range try by club captain Matt Challinor looked to have killed off Bedford, but a 75th minute try by skipper Nick Fenton-Wells made for a tense finish. Doncaster: Jarvis; Flockhart, Clark, Armitage,Lewis; Fosita, Field; Tom Davies, Thacker, John, Challinor,Hotson, Makaafi,Hills ,Stedman. Rep: Bergmanas, Hunter, Eggleshaw, Quigley, Foden,Roberts, Palu. Bedford: Jones; Tapley, Staff, Le Bourgeois, Adamson; Sharp, Baldwin; Parilli-Ocampo, Clare, Currie, Howard, Wells, Blanchet, Fenton-Wells, Thompson-Stringer. Rep: Harris, Williams,Boulton, Tupai,Veenendaal,Kerr, Dodge.